Oh, how I love when I find a time-saving trick to help me prepare a week-night meal! Last week, I started a new job that takes me into a different time zone in the wee hours of the day and back into my own time zone as I head home from a long day at the office. I am realizing that I will have to stock my fridge and freezer with lots of pre-made items and do lots of cooking on the weekends to keep up with things. 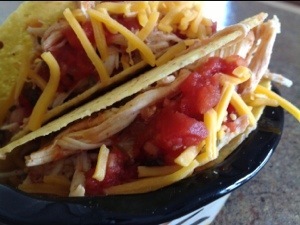 The crock pot will probably continue to be my “go to” appliance when preparing easy meals for my clan..
Easy Crock-Pot Chicken Tacos can be popped into the slow cooker in the morning and be ready when the family is looking for something yummy for dinner. A good friend recently shared a variation of this recipe with me, I have added a few things to give the meal a little more kick. The first time I made the dish, I followed the recipe exactly as it was written. My children thought my initial attempt was too bland, so I changed a few ingredients to suit the family. This ooey-gooey meal tastes great packed into tortilla shells or it can be served with tortilla chips as a fun dip. Either way, it’s chocked with lots of vegetables and lean meat. Great for a light summer snack dip of served with beans and rice as a hearty cold weather meal. Place the chicken in a slow cooker. Sprinkle the taco seasoning over the meat then layer in the vegetables and the salsa. Pour a half cup water over the mixture, set on low and cook for 6-8 hours. Remove chicken and shred with two forks. 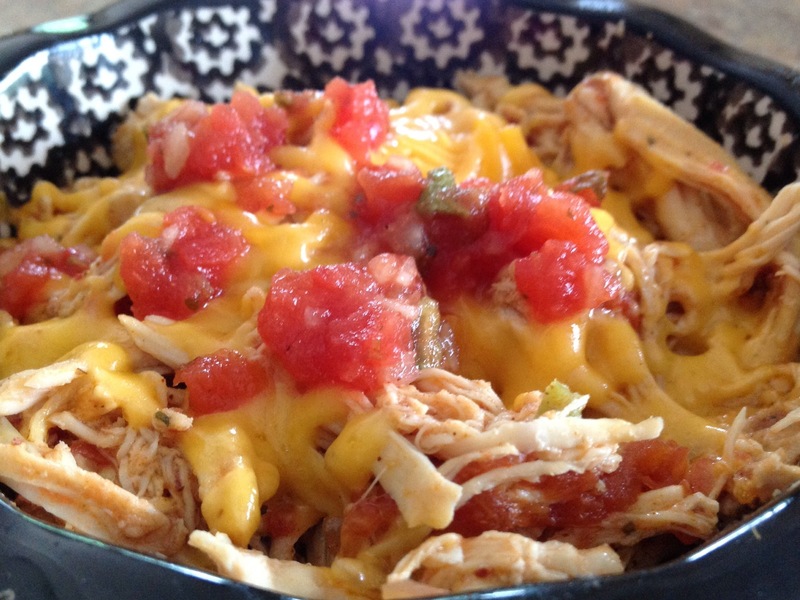 Pour shredded chicken back into the salsa mixture; mix we to incorporate. When ready to serve, sprinkle with cheese and top with a dollop of sour cream. Ohhhhhh I love tacos!! I will try this recipe!